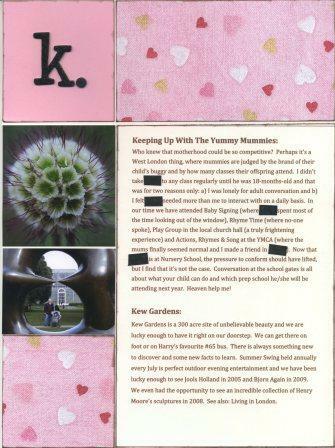 K is for Keeping Up With The Yummy Mummies & Kew Gardens. 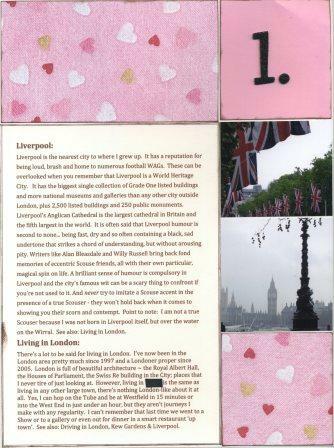 L is for Liverpool and Living in London. Who knew that motherhood could be so competitive? Perhaps it’s a West London thing, where mummies are judged by the brand of their child’s buggy and by how many classes their offspring attend. I didn’t take DS to any class regularly until he was 18-months-old and that was for two reasons only: a) I was lonely for adult conversation and b) I felt DS needed more than me to interact with on a daily basis. In our time we have attended Baby Signing (where DS spent most of the time looking out of the window), Rhyme Time (where no-one spoke), Play Group in the local church hall (a truly frightening experience) and Actions, Rhymes & Song at the YMCA (where the mums finally seemed normal and I made a friend in R****). Now that DS is at Nursery School, the pressure to conform should have lifted, but I find that it’s not the case. Conversation at the school gates is all about what your child can do and which prep school he/she will be attending next year. Heaven help me! See also: Motherhood. Liverpool is the nearest city to where I grew up. It has a reputation for being loud, brash and home to numerous football WAGs. These can be overlooked when you remember that Liverpool is a World Heritage City. It has the biggest single collection of Grade One listed buildings and more national museums and galleries than any other city outside London, plus 2,500 listed buildings and 250 public monuments. Liverpool’s Anglican Cathedral is the largest cathedral in Britain and the fifth largest in the world. It is often said that Liverpool humour is second to none… being fast, dry and so often containing a black, sad undertone that strikes a chord of understanding, but without arousing pity. Writers like Alan Bleasdale and Willy Russell bring back fond memories of eccentric Scouse friends, all with their own particular, magical spin on life. A brilliant sense of humour is compulsory in Liverpool and the city’s famous wit can be a scary thing to confront if you’re not used to it. And never try to imitate a Scouse accent in the presence of a true Scouser – they won’t hold back when it comes to showing you their scorn and contempt. Point to note: I am not a true Scouser because I was not born in Liverpool itself, but over the water on the Wirral. See also: Living in London. We found playgroup at the church hall a frightening experience too lol. I know I've told you before about our Hammersmith friends – they had a similar competitive experience (tho with some interesting bits. They went to a twins group and Imogen Stubbs was one of the mums). Ugh! I'm so glad I don't have to deal with the mommy competition anymore! I had almost forgotten that part of motherhood, and don't envy you for having to endure it but it's all part of the gig. Your write up about it is really cute. And I have to say that I really enjoyed reading your take on Liverpool. This might sound silly, and it's embarrassing for me to admit, but I had no idea it was anything other than the home of the Beatles! It's all looking great so far. I'm living the mummy stuff at the moment too – mostly I roll my eyes and ignore all the rubbish. I've found a lovely playgroup with very down to earth wonderful women and it has been a great experience – the others make me shudder!